What Is DA Form 3161? DA Form 3161, Request for Issue or Turn-in is a form issued by the Department of the Army (DA) and used for listing supplies that are turned in or are being issued to a certain party or individual. The latest edition of the DA 3161 was released on December 2017 and is in use today. This version does not override the 2011 edition of the form. However, electronic signatures might be unavailable in older versions. The form - sometimes incorrectly referred to as the DD Form 3161 - is available for download below. There are three forms related to the Request for Issue or Turn-in. The DA Form 3161-1 is a continuation sheet used when the space provided on the original form is not enough to input all necessary information. 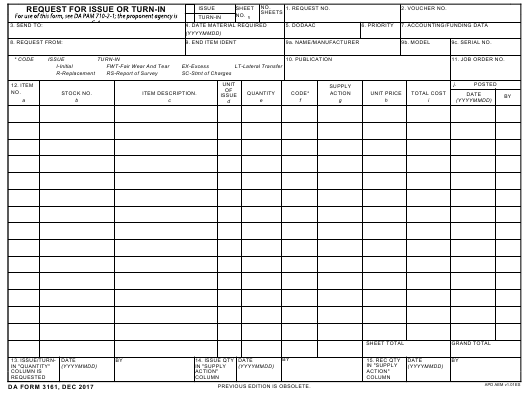 The DA Form 2062, Hand Receipt/Annex Number is used for keeping track of Army property handed out to personnel. The DA Form 2765-1, Request for Issue or Turn-In is a form used to request single-line items listed in the AMDF or to turn in items that do not require turn-in credit to the Supply Support Activity (SSA). How To Fill Out A Da Form 3161? What Are The Supply Action Codes For Da Form 3161? How To Sign A Da Form 3161? How Long Is A Da Form 3161 Good For? First of all, check the box that labels the form as a request of issue or turn-in. Enter all of the main information surrounding the request in Boxes 1 through 9. Fill in the information about the materials being sent: who are they being sent to, the date they are required, priority and authorizations, and all identifying information about the items to be issued or turned in. In Box 12 provide item numbers, stock numbers, descriptions, quantities. codes and prices for each of the items covered by the DA 3161. All costs and numbers must be added up an totaled at the bottom of Box 12. The authorizing party and all supply chain officers must sign the DA Form 3161. A copy of the form should be kept in order to keep records and assure that all items are accounted for and properly issued through the supply chain. You can print out and physically sign the form or use the electronic signature option available in the newest version of the document. Not all browsers support this feature: open the form in an Adobe Acrobat Reader desktop application to add your electronic signature. The DA 3161 is good for 1 month unless used as an issuing document. Check out the DA PAM 710-2, Using Unit Supply System (Manual Procedures) for more information.